In the evening of October 14, 2014, Metropolitan Hilarion of Volokolamsk, head of the Department for External Church Relations, arrived in Rome for an official visit, which will last till October 18. With the blessing of His Holiness Patriarch Kirill of Moscow and All Russia, the DECR chairman, acting as a representative of the Russian Orthodox Church, will attend the plenary session of the Third Extraordinary General Assembly of the Synod of Catholic Bishops on Pastoral Challenges of the Family in the Context of Evangelization and address the meeting. During his visit, Metropolitan Hilarion will meet with Pope Francis, Pope Emeritus Benedict XVI, Vatican’s Secretary of State Cardinal Pietro Parolin, President of the Pontifical Council for Promoting Christian Unity Cardinal Kurt Koch, and will deliver a lecture at the opening of academic year at the Southern Italy Faculty of Theology in Naples. 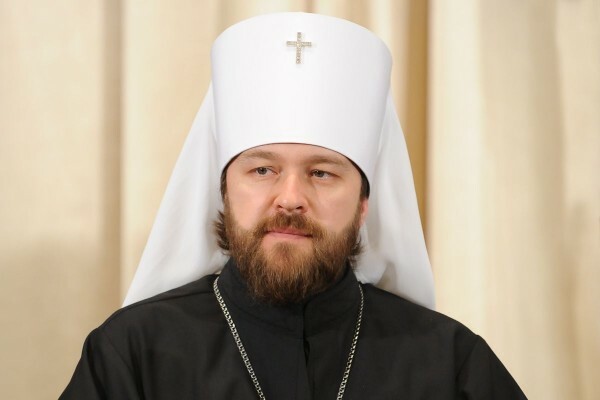 Metropolitan Hilarion will be accompanied by Hieromonk Stephan (Igumnov), DECR secretary for inter-Christian relations, Rev. Alexiy Dikaev, staff member of the secretariat for inter-Christian relations, and Hierodeacon Nikolay (Ono), postgraduate of the Ss Cyril and Methodius Institute of Post-Graduate Studies.